Thomas Sowell, the Rose and Milton Friedman Senior Fellow at the Hoover Institution at Stanford University, announced his retirement at the age of 86. He has been writing a column for 25 years, and has written numerous books on economic, political and cultural subjects. 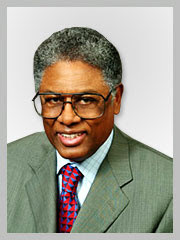 To get a flavor of his writings, I suggest you read his book, “The Thomas Sowell Reader,” available on Amazon. Sowell and Walter Williams have often been associated with each other as the foremost black economists who favor free markets. Sowell is six years older, but they have been life-long friends. Both experienced the racial challenges of their youth. Williams earned his Ph.D. from UCLA, and Sowell went to Harvard and received his Ph.D. in economics from the University of Chicago. Since then, both have been advocates of market solutions to problems of discrimination, inequality and poverty. When I wrote my book, “Economics on Trial,” an expose on economics textbooks, Sowell sent me a letter telling me his experiences with Paul Samuelson, the famous Keynesian economist who taught at MIT. However, it’s clear that Milton Friedman and the Chicago school had a much greater influence on Sowell. Sowell also wrote a textbook, “Basic Economics,” that became a bestseller. I found several major issues that had been left out of the first edition, including Say’s law (supply and production is more important than consumption), and wrote him about these omissions. The next edition contained all my suggestions. I’m a fan!